...AND MORE!!! Click here to SIGN UP TODAY! EMAIL ME if you have any questions--I'm happy to answer, no obligation! If you want to order Retiring Products in your Starter Kit, be sure to JOIN MY TEAM no later than June 1st. You can also choose to include NEW Catalog Preorder Items (including Exclusive Hostess Items, and new In Color products) in your Starter Kit if you join no later than June 1st. Let me know if you want to do this, and I will make sure you get to see all the choices available to you! Note: Starter Kit online ordering will not be available June 2nd from 12:01am until Noon MT, so the NEW Catalog items can be loaded. RETIRING PRODUCTS WHILE SUPPLIES LAST!!! This is one of the cards we made at my Farewell Party today...it's the same design as a card you've seen me make before (video tutorial HERE), but there's a new twist. 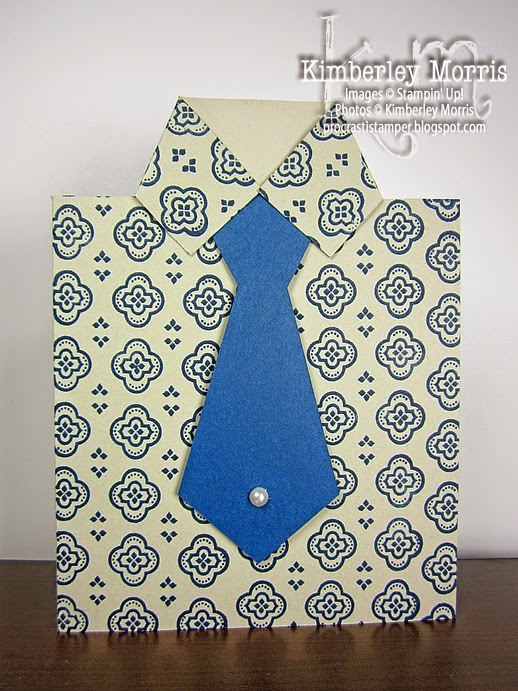 Instead of an origami necktie, I imported an SVG necktie stamp from the digital download Oh Joy, A Boy! Ensemble into my ecutter software and it did all the hard work for me! On the inside of the card, I used the You're Amazing stamp set--which is also retiring and still available, but only in wood-mount. It IS on SALE, though, so snag it while you still have a shot at it! With its vintage, neutral look, it's great for masculine cards. Speaking of neutral, I used Sahara Sand card stock for the card base, and that item is NOT retiring. Demonstrators have been informed that a Retiring List BLOWOUT SALE will start on May 22nd, and go through June 4th, with 25% to 50% OFF prices! I don't have all the details yet, but go ahead and enter my ONLINE STORE, or check back at my blog on the 22nd, to find out what's been discounted. I am not making any promises, but the wording of this special as it was communicated to us, leaves me wondering if some of the Retiring Items may have been restocked...??? Here's the verbiage I noticed: If you missed out on a product the first time, this is your last chance to get it before it's gone for good! All I can say is, if there are going to be second chances--YOU WON'T WANT TO MISS THIS SALE! Updated 5/22/14: No additions or restocked retiring items, so sorry! May Parties: Out with the Old and In with the NEW...Catalog!!! If you aren't local, but are interested in placing an order in my ONLINE STORE, I have surprise BONUS gifts for out-of-area customers who order from now through 10pm MT on May 31st, using Hostess Code FA7BFMA9--and I'll mail you your NEW catalog for FREE with a $75+ order! 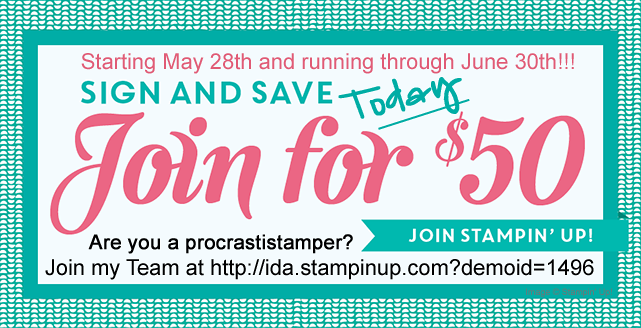 Join me in bidding the 2013-14 Stampin' Up! Annual Catalog a fond FAREWELL at this event! Your admission and Door Prize Entry is FREE with RSVP. Get fun product SURPRISES and TREATS, make projects featuring some of my favorite retiring products, take a peek at the new catalog items that are coming soon, and...take home the NEW catalog!!! Welcome the NEW 2014-15 Stampin' Up! Annual Catalog with me at this event, and get your FREE COPY to take home! 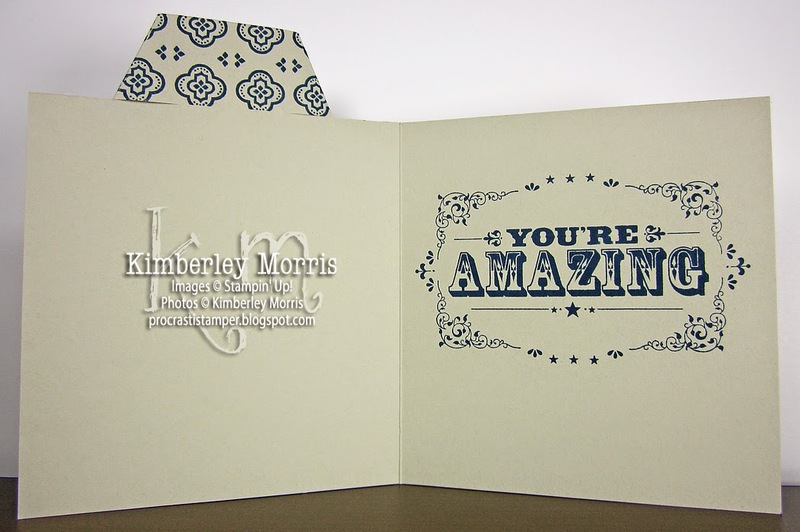 See a selection of the incoming products, including Stampin' Up! 's new alcohol markers--Blendabilities!!! Create your own personal 2014-16 In Color Sampler Bookmark. Make a quick and fun card, PLUS a fabulous NEW die-cut treat box! I'm so excited to show you all the FUN NEW STUFF!!! 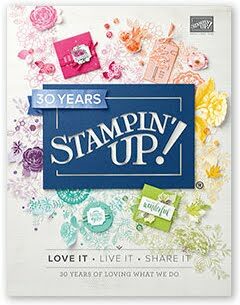 If you haven't heard of Stampin' Up! 's NEW Blendabilities alcohol markers yet, it's okay--you can't even buy them yet...unless you are a demonstrator, in which case you can preorder them! So, as a customer, you'll have to keep a handkerchief around to dab the salivation away until June 2nd! (or just Become a Demonstrator and get them NOW!) 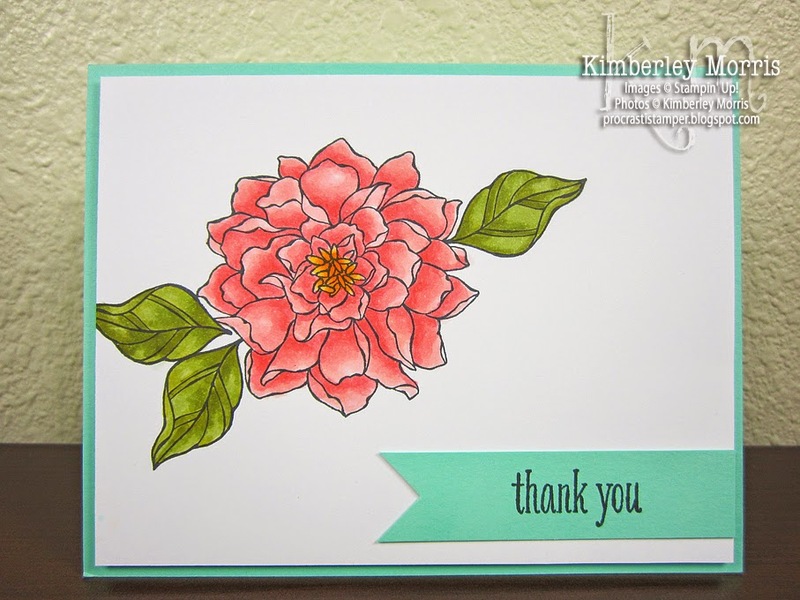 But, I really had to show you this card because the Peaceful Petals stamp set (available in wood-mount or clear-mount) is perfect with Blendabilities, and this stamp set is NOT in the new catalog. It is featured in our current Occasions Catalog, which ends June 1st. I do not even like flowers, but I am telling you that you NEED this stamp set to use with your NEW Blendabilities markers...so don't let it slip away! If you didn't know this flower was colored, and not printed out from a computer, it might look rather plain to you. Actually, I designed it to use very few supplies, specifically because of the fact that it is hand-colored. I want that coloring and blending to be the focal point of my card. I want you to know that this is my FIRST attempt at coloring a flower with alcohol markers, because I want you to know that that is how easy it is to be successful at it. I mean, I think it turned out really pretty and vibrant...though I'm obviously biased. I might go back and add some shadowing to it later, but I want to practice that a little more first. I was thinking that I could have stamped the flower more towards the middle of the card, but I actually kind of like that one of the leaves goes off the edge, because it sort of "anchors" the flower to the card. The only ink pad I used was the NEW Tuxedo Black Memento Pad (also not available for customers until June 2nd), which I also used for the flower stamp. (StazOn black can bleed with the Blendabilities alcohol markers, so you need to use Memento ink) And I know that I didn't really tie in the Coastal Cabana card stock color on the flower, but it screams Spring freshness, so there ya go. And one last disclaimer: I did not actually use Blendabilities on this card, because not all the colors I wanted to use are available even to demonstrators to preorder right now...so I used another type of alcohol marker in coordinating colors, to simulate the look you can expect from the Old Olive, Calypso Coral, and Daffodil Delight Blendabilities sets.